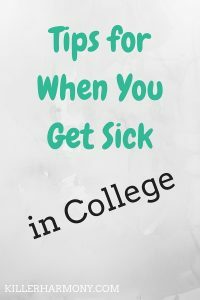 Thanks for sharing because getting sick in college is a reality. I liked your bonus tip the best; I always try to be prepared in case I get sick. I take it one step further and make sure that I always have some kind of quick and easy food on hand, because no one wants to trudge down to the dining hall (and no one wants you there if you’re germy Seriously, stay home!) Or stand over a hot stove when they’re sick. Yes! Having food on hand is a good idea, especially because while the dorm might have vending machines, those always cost more than simply buying food from the store.